Eucharistic Adoration is held each Tuesday, from 2:00 PM to 6:00 PM. Parishioners come for a period of time before the Blessed Sacrament to pray and be with the Lord. This gives them the freedom to use different methods of prayer to praise God and to pray for their own intentions and those of the Church. At 3:00 PM, the Divine Mercy Chaplet is prayed. The Nocturnal Adoration Society is an association of Catholics dedicated to prayer before the Blessed Sacrament for the purpose of praising God and praying for the needs of our parish, church, country, and the world. Immaculate Conception Parish has had a chapter since 1963. Members are assigned to a band. The Blessed Sacrament is exposed between the hours of 10:00 PM and 6:00 AM on the first weekend of each month. Each band spends one hour in prayer using a prayer book based on the Psalms. Bands rotate between the different hours each month. Adoration concludes with a Benediction at 6:00 AM. 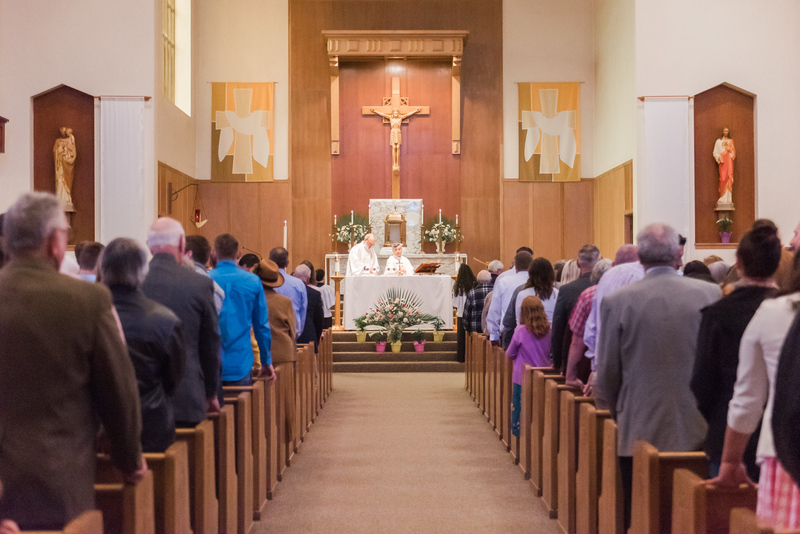 Parishioners are invited to have their Mass intentions included during daily or Sunday mass. If you request that a Mass is offered on a particular date, we will make every reasonable effort to meet that request. Please contact the Parish Office at 503-759-2656 for especially dated Masses. A donation of $10 for each mass is requested but not required. The MMP is a movement of priests and an invitation by Mary for priests, religious and the faithful to gather together with her in prayer and fraternal love. The cenacle consists of invocation to the Holy Spirit, recitation of the rosary, prayers for the Pope, reading, and meditation. The group meets Saturday mornings after the 8:00 Mass in the church. Do you need to have a name added to the parish or community sick list? Simply call the Parish Office at 503-769-2656 or send an email to [email protected] Prayer requests will appear in the bulletin until it is no longer needed. We rely on our parishioners to keep in contact with the parish office so we can stay current! The purpose of the Small Church Communities is to deepen one's faith praying the scriptures and seeing how the scriptural passage that is being prayed is speaking to each person in the group. By sharing this experience, a mutual caring for one another and a sense of belonging and support for one another develops. The outgrowth of the caring and support leads to service to which every Christian is called and to which we are commissioned at the end of every Eucharistic celebration. If you would like more information about Small Church Communities, please contact the Parish Office at 503-769-2656.